The Puebla de Sanabria Parador is sited well in a good position 12 kms. from the scenic Sanabria lake which is the largest in Spain of glacial origin. Located in the middle of the region of Sanabria, bordering with Portugal, this Parador is ideal for travellers and lovers of the countryside. The decor of the interior rooms offers the quality and warmth necessary to make for a pleasant stay. The lounge has an open fire in winter and some of the bedrooms have large windows with views of the old town of Puebla de Sanabria. In the restaurant try some of the exquisite products of this region including "habones" (large beans), trout and blackberry tart. In Puebla de Sanabria you may like to visit the castle of the Condes de Benavente. In the valley of Tera see the romantic churches in the villages and finally make a car journey to near-by Portugal to visit Braganca with its Pousada looking at the castle across the valley. You may enjoy the medieval market near the Parador of Puebla de Sanabria in the middle of August or the Easter celebrations in the city of Zamora. Experience the Festival of the Victorias celebrated on the days 7, 8 and 9 of September in Puebla de Sanabria which includes fireworks and street parades. It is an easy 15 minute walk across the river and left up the road to the village shops and bars/restaurants, then up some more to the church and castle. From there you can return down 233 steep steps back to the river.. The activities in this area are walking around Lake Sanabriaor in the Culebra "sierra" (mountains), pony trekking,four wheel drives tours, hang gliding, canoeing, fishing, and hunting. 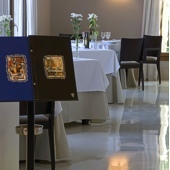 The Parador Puebla de Sanabria has thirty twin bedded rooms, eight double bedded rooms two, suites and two easy access rooms. 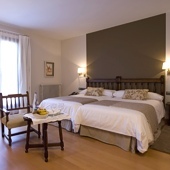 In the rooms you will find a telephone, television, TV canal plus, safe and a mini bar. Also there is central heating, air conditioning, currency exchange, lift, facilities for the disabled, garage and parking facilities (without security and limited places), a garden with children's playground, seasonal swimming pool, restaurant, bar and conference facilities if required. Distance from the nearest airport is approximately 196 kms and the nearest train station is 2 kms away. We stayed for six days at the Parador Puebla de Sanabria and this was very pleasant. However the staff at the reception was not so friendly and helpful. We coplained because the airconditioning was not working and outside the temperature was 25 degrees. We chose this Parador because there was airco and my wife is ill and cannot support the heat. This was very disagreable. We asked several times to do something about it but this was never done and when we asked why they said it was never on at this temperature. The staff in the restaurant and at the breakfast was very attentive and helpfull. The facilities were attractive, very well taken care of, clean, comfortable and relaxing. From our room we had a lovely view of the countryside and the village of Sanabria. In the morning we enjoyed a full breakfast buffet with many delicious choices from which to choose. Delightful. A short distance from the parador is the village of Sanabria. It is a must see with its medieval castle, church and other interesting historic buildings. We certainly hope to visit this region again and we plan to stay at the parador hoping the airco will work then. Our stay at Parador Puebla de Sanabria was very pleasant. The staff was friendly and helpful, yet professional. The facilities were attractive, very well taken care of, clean, comfortable and relaxing. From our room we had a lovely view of the countryside and the village of Sanabria. In the morning we enjoyed a full breakfast buffet with many delicious choices from which to choose. Delightful. A short distance from the parador is the village of Sanabria. It is a must see with its medival castle, church and other interesting historic buildings.A little gem. If I am in this part of Spain, I would certainly stay here again. O Parador fica aos pés da elevação onde se encontra Puebla de Sanabria, ou seja, aproximadamente a uns 15 minutos a pé. As instalações são novas, amplas e voltadas para o seu exterior. O quarto que nos ofereceram era bem amplo, completo e confortável, além de silencioso. Sua janela permitia uma visão de Puebla de Sanabria que, durante a noite ilumina suas muralhas e construções criando uma visão interessante. O restaurante e o café da manhã foram bastante satisfatórios e os empregados atenciosos. O passeio ao lago, embora um pouco distante, vale pela beleza natural. Como fomos fora da alta estação (inverno), não vimos muito turismo na cidade que é pequena porém muito charmosa. 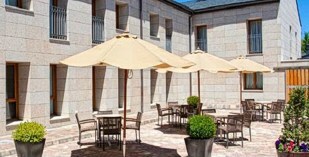 Parador de Puebla de Sanabria is a recent building convenient to the road to Galicia.